A stereotype, which occasionally makes its appearance, is that the Apostle Paul was a misogynist. As one proof of this they attach to him the following words: "...that the wife fear her husband" (Eph. 5:33). The truth, however, is completely different. First, it is a hermeneutical error to use passages cut off from their context. To properly understand a passage the following questions should be answered: who, where, when, how and why it was said. In this case the correct phrase is found in a letter that the Apostle Paul addressed to the faithful of the Church of Ephesus. In this letter Paul presents the new vision of life brought about by Christianity: the whole creation is the work of God's freedom and love, which is why humanity is called to transform into a global fraternal society. Any hostility and strife of peoples should be replaced by reconciliation and mutual love. Therefore, those who want to be Christians should adopt this new view of life and transform in every aspect of life. Thus, in the fifth chapter of his letter, Paul refers to the transformation that must take place in the relationship of man and woman, or husband and wife. Paul does not merely seek a change in the legal framework but, above all, in the transformation of consciences. In society at that time the wife was to be completely subject to the husband, while the husband had no obligation to the wife. Rejecting this mindset Paul raises a new standard, a new target: the reciprocity of love. Denying unilateral submission, Paul suggests mutual self-giving. So in the greater portion of this text there is reference to the "obligations" of a husband. In order for a wife to "submit" to a husband, the husband must first love her with the same intensity with which Christ loves the Church; a husband must first love her with the same intensity with which each person loves their own body; a husband must first love her with the same intensity of love that he will sacrifice his own life on her behalf. Then the wife is called to "submit" to him, responding with the same strong love. This response of love is what Paul refers to at the end of the text, when he writes: "...that the wife fear her husband" ("η δε γυνή ίνα φοβείται τον άνδρα"). The word "that" or "ίνα" (and not "should", as many misinterpret the text to read) means the love of the wife follows the love of the husband. Regarding the word "fear", this word has many meanings depending on the context. Here it does not mean that a wife should be "afraid" of her husband. How could it be possible to fear someone who loves you to the highest degree? The word implies this: Because the wife accepts the gift of the sacrificial love of her husband, she must "fear" that she proves to be unworthy of such a gift. For example: When someone has been invited as the main speaker at an international and prestigious conference and says he is "afraid", he does not mean that outside the room one will do him harm. What he is "afraid" of is whether or not the speech is on a comparable level so it responds worthily to the honor of the invitation. 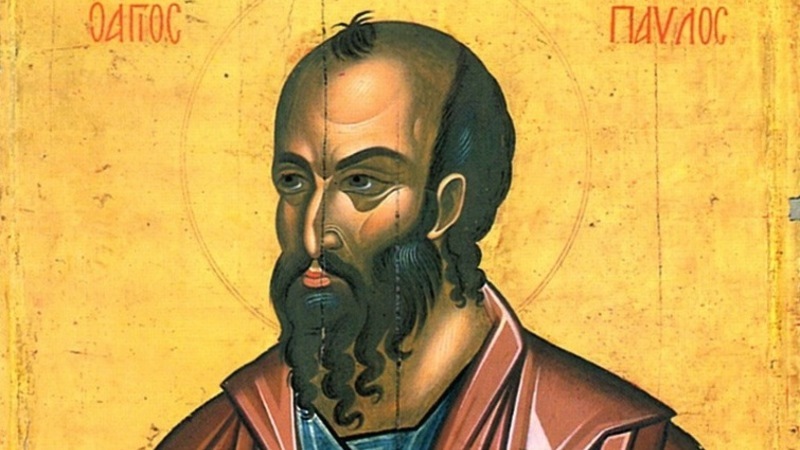 In the fourth century, St. Gregory the Theologian, following the example of Paul, criticized the double moral standard of androcentricism, saying: "In respect of [chastity], I see that the majority of men are ill-disposed, and that their laws are unequal and irregular. For what was the reason why they restrained the woman, but indulged the man, and that a woman who practices evil against her husband's bed is an adulteress, and the penalties of the law for this are very severe; but if the husband commits fornication against his wife, he has no account to give? I do not accept this legislation; I do not approve this custom. They who made the law were men, and therefore their legislation is hard on women... It is well for the wife to reverence Christ through her husband: and it is well for the husband not to dishonor the Church through his wife. 'That the wife,' he says, 'fear her husband,' for so she does Christ; but also he bids the husband love his wife, for so Christ does the Church" (Oration 37, chs. 6-7). * Stavros S. Photiou is Professor in Educational Sciences in the Department of the University of Cyprus.